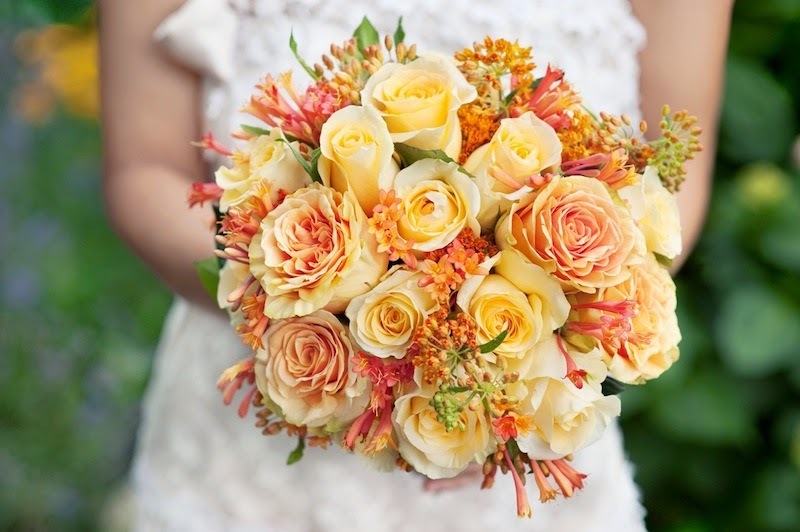 For beautiful and memorable wedding flower bouquets, today's brides are getting creative. Instead of letting a florist know the bridal party colors and leaving the design ideas up to them as bride's used to do, bride requests are getting very specific. In fact, an informed and open bride combined with a creative and expressive florist can make for some stunning bridal bouquet arrangements. The only downside will be when the flowers fade! Read on for some creative bridal bouquet ideas for the bride, the bridal party, the head table and the wedding reception decoration as well. Colors: Oh, what you can do with colors! Whether you use the flowers themselves or the ribbons and bows or candles, getting creative with color is a wonderful way to create a memorable event. 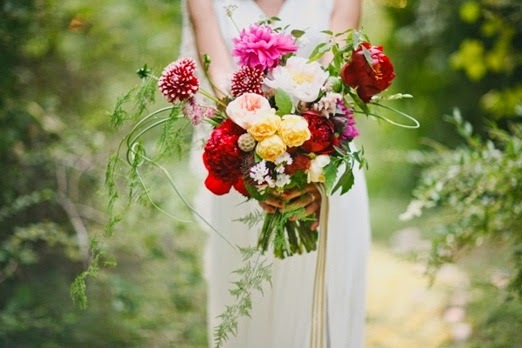 Picture, for instance, wedding flowers starting from light pink and moving to deep fuschia or purple or red as you progress through the bridal party, or perhaps around the reception tables, each bouquet or centerpiece a different color than the next, getting deeper and more vibrant. Perhaps, instead, you have a black and white theme and choose vibrant red or orange or purple flowers to add a dramatic splash of color and style. For a garden or very formal themed wedding, an all-white palette for floral bouquets and centerpieces is absolutely stunning, and can be combined with silver, bronze or gold accents for a little sparkle. Themes: Orchids and tropical flowers for a Hawaiian theme, with torches and leis, or beautiful seasonal flowers for a Spring bouquet: you can use your wedding flowers to express any number of themes. Elegant winter white sparkling with greens and silver for the winter Holidays or casual garden bouquets for a summer afternoon wedding showcase wildly different flowers. Be sure to take into account the dress styles when considering the formality level of the flower arrangements. Accents: Here's where you can get really creative. 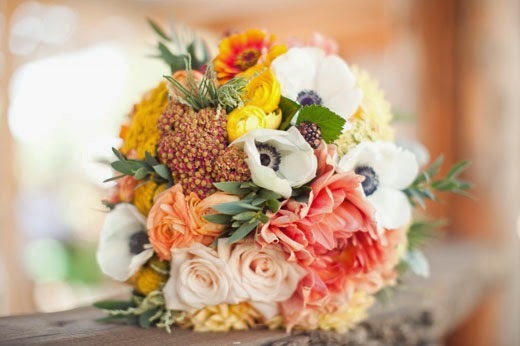 Tucking little accents into your wedding flower arrangements will make them truly unique. Try sprays of gem for a glittery showpiece, small shells for a seaside or beach wedding, beautiful butterflies or dragonflies for a garden wedding, or shimmery snowflake shapes for a wintery wonderland effect. These are just a few quick ideas, so once you get your imagination rolling you're sure to come up with many more! Looking through bridal magazines tends to be the primary source of inspiration for brides, but there are many more places to get ideas. Go to beautiful hotels and look at the decor or even look in elegant shop windows. Think also about your personal likes; for instance if you love birds perhaps you could tuck tiny bird figures into some of your wedding flower arrangements. 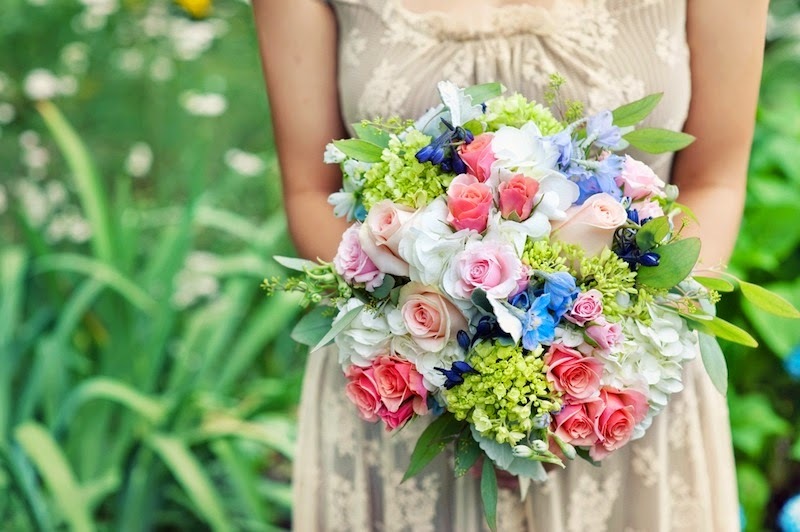 The sky's the limit for creative wedding flower ideas!